Built entirely by volunteer labor, the Peace Pagoda was inaugurated in 1985, one of approximately 80 worldwide. Nipponzan Myohoji is a Buddhist religious order founded by the Most Venerable Nichidatsu Fujii in 1917. In the course of his life spanning 100 years (1885 – 1985) Fujii Guruji walked and prayed for peace beating a prayer through many parts of the world. He instructed his disciples to do the same. He also urged the building of Peace Pagodas to be places of individual and collective focus on peace. Fujii Guruji also lived with Mahatma Ghandi in India and supported the non-violent independence movement of the Indian people. 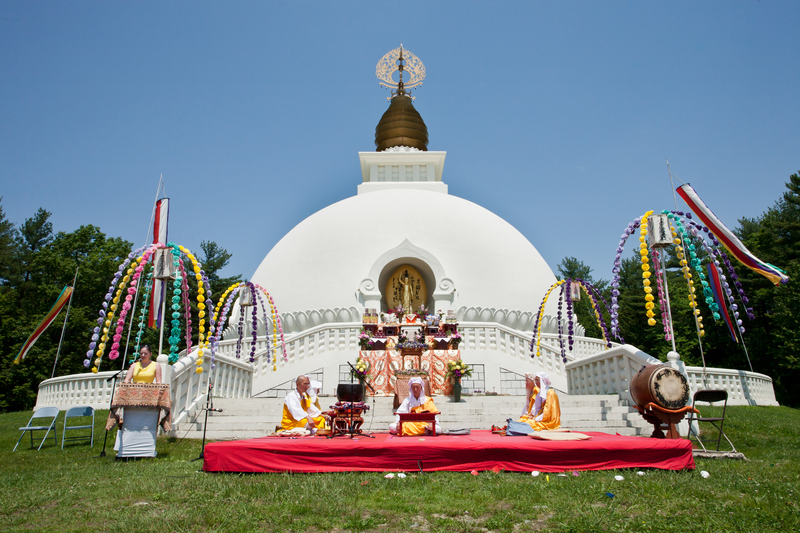 The New England Peace Pagoda is a place for people of all faiths and backgrounds to come together in peace. The actual Pagoda structure is a memorial containing a relic of the Buddha. To the left of the pagoda is the new temple, a place for prayer and the eventual living space for the monastics of the Leverett Pagoda. Currently the temple is still undergoing construction with the help of volunteers from all over.